Alert: StumbleUpon has been moved to Mix.com now, so the Interface has been changed now. So the URL submission procedure varies a bit. But the potential to drive a huge amount of traffic is the same as earlier. StumbleUpon started almost in 2001-2002. It is basically a social Bookmarking site. It is a hub where you can find tons of web pages and you can filter it out according to your interest. And for bloggers, it is quite important to submit Website to StumbleUpon as it is quite helpful to increase blog traffic by just a URL submit. We can easily submit site to StumbleUpon and make it reached to the readers. For Bloggers, this can be one of the effective sources to get a lot of free website traffic. It is been proven to almost every blogger. For any new user of StumbleUpon, it could be a little confusing to submit a link there. We can submit a link through a StumbleUpon website and through a toolbar as well. here are the browser’s extensions Google chrome and Firefox Add-on. All kind of mobile apps is also available for StumbleUpon for easy sharing. And these days almost every websites or blog has a sharing StumbleUpon sharing button which also does the job. You can get a lot of traffic from Stuble upon and be saying this by experience, few things we need to take care after the URL submit. The tags should be relevant to the web page, or else the page will be stumbled and will result in an increase of bounce rate. And it is not good for any website. 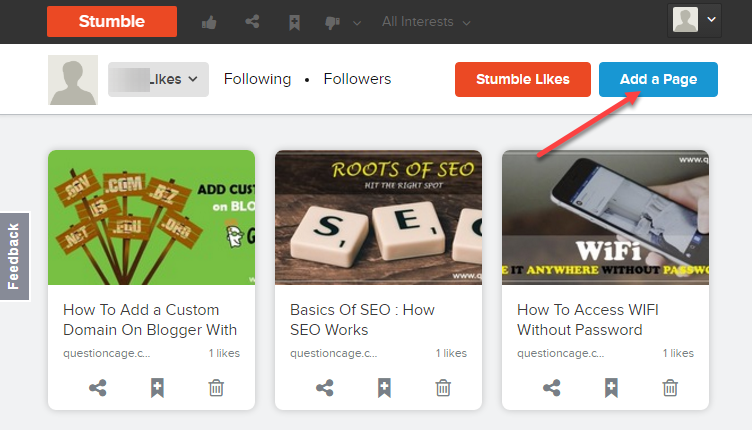 You can easily Boost blog traffic with the use of StumbleUpon. Step 2. click on Add Page to add a URL of the website. Safe for Work – Here we need to check “Yes” to assure the content we are posting is safe. What is this page about? (Choose one) – Here we need to add what our page is all about, be very precise about this as the user wants to read only those posts, which are their preferred topic. And if the content is not related to their interest, they will skip the page and it will result in the increase in bounce rate, which is not good for any blogger. Add on or more tags – Add some keywords in this section about the posts. Step 4. Click on the Save button. Submitting your URL to StumbleUpon is a good way to increase blog traffic and the results are quite prompt.